Maile Meloy is a gifted writer. Her prose will often fixate on miniscule details for pages while other instances she will cover vast passages of time with the quick deployment of a sentence or two. She has a handle on how subtle gestures can leave a lasting impression, and how the rarity of those gestures can cause time to pass you by, leaving you to wonder where it all went wrong. Her pieces, from her short story collections “Half in Love” and “Both Ways is the Only Way I Want It”, are all melancholic, if not without a sentiment of hope. Kelly Reichardt’s Night Moves occupies the head space of its main characters to a suffocating degree. But there is one particular scene in the film, before the proverbial bang, that encapsulates a broader and more concerning cultural phenomenon: that of social indifference. The shot comes from inside a forest preserve cabin. The lush greenery and passing camping troops are seen through the cabin’s window. Reichardt maintains the stationary shot, with a television occupying the top center portion of the screen, directly above the window. “The Price is Right” is the program of choice - the bright colors and heightened gestures bullying your eyes away from the dense forestry. A truck hauling a boat passes by. It arouses not the slightest acknowledgement from the cabin dwellers, who are deeply involved at the sight of a contestant spinning the show’s big wheel. The boat and the three passengers inside the pick-up truck exist parallel to the site’s campers: their intentions based on misguided fundamentalist teachings. The guns don’t blaze and John Wayne isn’t coming to your rescue in Kelly Reichardt’s latest film. 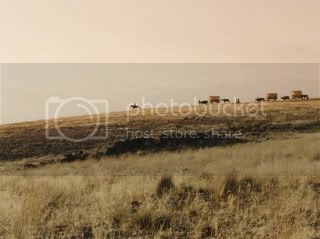 From the onset of Meek’s Cutoff, Ms. Reichardt shows her characters meticulously trying to cross a creek as they lead their oxen and wagons through. The scene, like most of the film, is unspoken. The sound of disturbed water, fussy oxen, and creaking wagons permeate the screen. 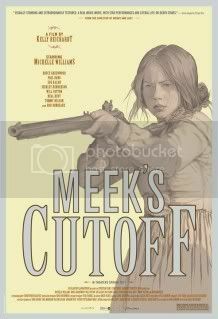 It’s a scene that prepares the audience for the journey at hand – Meek’s Cutoff is a film that is not concerned with bombastic Western tropes of good vs. evil, but instead focuses on the harshness of the terrain, the blistering isolation of the trek, and the realities of the Old West. The characters crossing the creek are comprised of three families and their guide, Meek (Bruce Greenwood). There are three women (Michelle Williams, Zoe Kazan, and Shirley Henderson) with their respective husbands (Will Patton, Paul Dano, and Neal Huff). Glory and William White (Henderson and Huff) have a child named Jimmy (Tommy Nelson). This group of eight journey down the Oregon Trail, with their hopes and desires being unclear. Upon Meek’s Cutoff’s conclusion, the characters are just as much a blank canvas as they were from the onset – a purposeful and startlingly effective example of how the terrain can be used to overwhelm character development. Ms. Reichardt and writer Jonathan Raymond isolate their characters to make actions internal. Momentary interventions of intensity are usually done for effect, usually for the comedic (in Zoe Kazan’s doe-eyed raves) or to express rising anxiety (Michelle Williams’ loading a musket rifle, one shot at a time). Note that the action is largely produced by the women. Reichardt is clever in how she moves the action forward – the men are obviously making the decisions, with Meek leading the way. But they’re lost with water supplies running low. Blame needs to be allocated, and Emily (Williams) notices the cracks in Meek’s bravado. The similarities between Meek’s Cutoff and Ms. Reichardt’s 2008 effort, Wendy and Lucy, largely focus on the subordination of women. Strong female characters (played by Michelle Williams in both cases) are left to fend for themselves in a male-dominated world. The period gap between both films serves to convey the different ways in which subordination exists by the hegemonic elite, with Williams’ role as Emily and Wendy struggling to combat opposing forces. Both films show Williams as strong, though overcome by having to fight a never-ending fight. And in both films, you gather that the journey (if it be to Alaska or Oregon) is incomplete. Another interesting comparison point would be looking at the film as a realist’s response to the surrealist Dead Man. There are some interesting similarities between Meek’s Cutoff and Dead Man, though contrasting qualities that make them quite difficult to compare outright. My kneejerk reaction to Meek’s Cutoff was that its characters were largely on their way to Hell, led by a Satan-figure in Meek. Though the realism in which Ms. Reichardt and cinematographer Chris Blauvelt conceptualize the trek makes it difficult to see that theory work. But given the way that Dead Man is led by its male characters through a journey to the abyss, Meek’s Cutoff could be a rugged attempt at fighting out of that abyss, scurrying for survival. In all, I preferred Wendy and Lucy (and Dead Man) to Meek’s Cutoff, largely because the formlessness of Meek makes it difficult to embrace on an emotional level. You get a sense of isolation, but it’s almost stifling to be placed in such a dire situation for a prolonged period of time. The minutia of the journey is admirable, though at times unnecessary – Ms. Reichardt really strives to get you involved in the surroundings, but at some point in the film, you want to step back and view it from afar.